March 31, 2011 - The world’s leading trade fair for intimates and beachwear fabrics, Interfilière is the only international-scale event which brings together both markets. Nature with its infinite treasure and looks never ceases to inspire us. A 'Nature' that often leaves the beaten paths, ready to lead us to fairytale, deeply mysterious grounds. Top position for mineral nuances and effects, to combine with refined mixtures of details, materials and finishes. Interfilière color specialists are unanimous: while minimalism continues to seduce and conquer RTW, bodyfashion needs to remain true to the value which its success is based on - pleasure. Colors are decoded in order to display the nearest color codes. 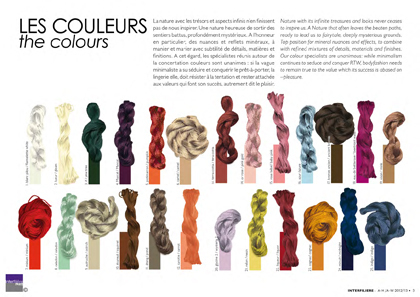 Please check out the INTERFILIERE Color Trends Autumn/Winter 2012/13 Pdf File for more information.